These courses are taken on a 125cc motorcycle. All our 125cc motorcycles have gears. Passing the test will give you an ‘A1’ motorcycle licence which allows you to ride a 125cc machine without ‘L’ plates and to carry a passenger. You can use your own automatic 125cc scooter for this test, but you will then be restricted to automatic motorcycles. The practical test is in two parts – Module 1 and Module 2. You need to pass them in order. You need to be age 17 or over. Before you can start the training you must have a valid CBT and a valid motorcycle theory test pass. If you don’t hold a valid CBT certificate, then you will have to complete a CBT first on day 1 of your course. The theory can be arranged by ringing 0300 200 1122 or by visiting link on the right. 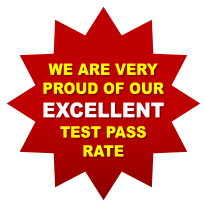 Once you have passed both modules you will have a full category A1 licence to ride a 125cc motorcycle. When you have held an A1 Test for a minimum of two years you may upgrade to an A2 standard licence by just retaking Modules 1&2. You will not need to take the CBT and theory test again if you take this route.